Explore the Bucegi Mountains and discover the beauties of nature. Here you can learn about virgin forests and wild animals! Through the surroundings of Bran there are numerous tourist routes, both for beginners or advanced. Try the one that fits you! Brasov county is very wooded, so here is a very clean air and full of oxygen and ozone. Your health can be better! It is a real pleasure for us to welcome you to our website. Here you can find a lot of information about our well-tended & cosy VAMPIRE campground. The camping facilities are very centrally located and this offer you an ideal starting point for many different sport and leisure activities throughout the season. We wish you lots of fun while you are exploring and scoping out this site. If you do have any questions, please feel free to contact us at any time. 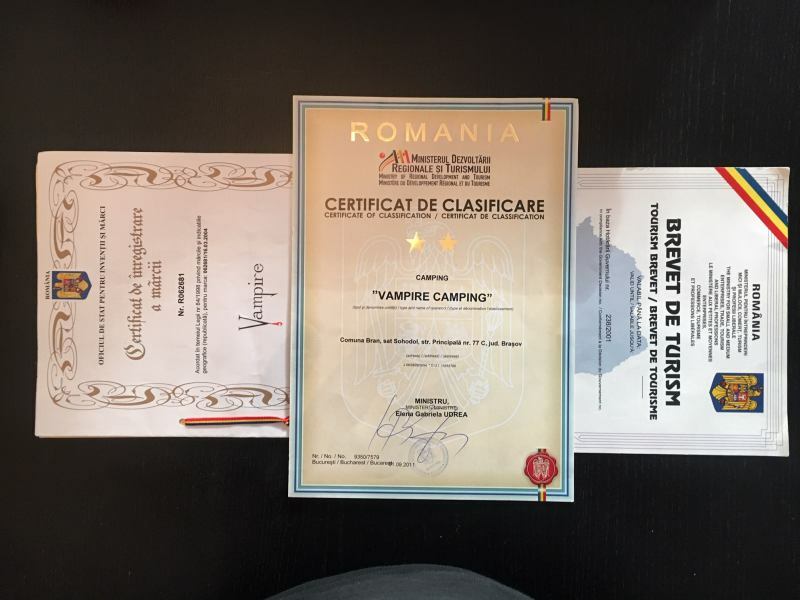 „VAMPIRE Camping” …a somewhat different kind of campground, big enough, with a family atmosphere, where our guests are also our friends. – A solid road leads you to there Mobile Home locations. – Solid ground for Mobile Homes and Caravans. – Each locations can connect up to 6 ampere electricity point. – Multi language staff: Dutch, English, German, Italian and Romanian. – The reception is open: 24 hours, 7 days a week. – Telephone, Fax and Internet facilities at reception. – Breakfast, snacks and barbeque are served. – Bar with special drinks like Vampire Wines. – We have places by the river, in the shade or a sunny place. – Bungalow tents for rent; go to: RESERVATION. „To experience the richness of Romania’s landscapes and its cultural heritage, customs, and traditions there is but one single option: a holiday on the land side.